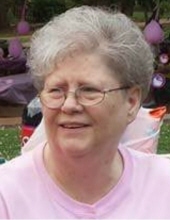 Mrs. Brenda Joy Jackson Dunn, age 69, of Rockmart, GA passed away Saturday, November 24, 2018 at her residence following a lengthy illness. She was born in Albany, GA on May 11, 1949, a daughter of W.A. Jackson and Ada Hazel Carroll Jackson. Mrs. Dunn had been a resident of Rockmart since 1966 and was a member of the Van Wert Baptist Church. She loved to cook, go shopping, travel to the mountains and write recipe books. In addition to her parents she was preceded in death by a sister, Sue Pilkinton. Survivors include her husband, Rev. Danny Dunn to whom she was married on July 16, 1966; daughter, Missy Wilkes; son, Dell Dunn; step son, Britt Earwood, all of Rockmart; sister, Jean Lawson, Sylvester, GA; 12 grandchildren; 4 great grandchildren; a number of nieces and nephews and special care givers: Brittany Dunn, Amanda Smith and Jennifer Swift. Funeral services will be held Tuesday, November 27, 2018 at 4:00 pm in the chapel of the Alvis Miller & Son Funeral Home with Rev. Jimmy Shoemaker and Rev. Todd Cash officiating. Interment will follow in the Rose Hill Cemetery with Rev. Steven Swift officiating. Pallbearers will include: Britt Earwood, Spencer Earwood, Spencer Cornelius, Jordan Cornelius, John Williams and Heath Dunn. Honorary pallbearers will iniclude: Alex Cornelius, Ricky Hayes, Jack Jarrett, Joe Cochran and C.J. Poole. The family will receive friends Monday evening from 5:00 pm until 8:00 pm at the funeral home. The Alvis Miller & Son Funeral Home is in charge of arrangements for the funeral of Mrs. Brenda Joy Jackson Dunn. To send flowers or a remembrance gift to the family of Brenda Joy Jackson Dunn, please visit our Tribute Store. "Email Address" would like to share the life celebration of Brenda Joy Jackson Dunn. Click on the "link" to go to share a favorite memory or leave a condolence message for the family.